Church of the Gesu is a Gothic-style church that was completed and dedicated on Dec. 16, 1894. Twelve years later, Marquette College (as the university was first known) was built next door. The church features a pipe organ built in 1899 that was originally installed in the Studebaker Theater in Chicago. Church of the Gesu acquired this pipe organ in 1908. The church seats approximately 1,000 people, holds Mass daily, and hosts free organ concerts every month. To see the schedule, please visit gesuparish.org. The church is named for the Mother Church of the Society of Jesus in Rome, Chiesa del (Santissimo Nome di) Gesù, which translates to Church of the (Most Holy Name of) Gesu. 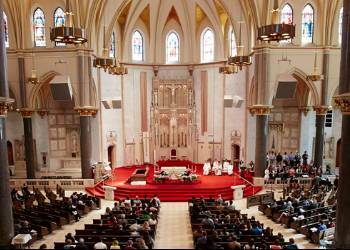 Today the church, being the Jesuit-sponsored parish of the Archdiocese of Milwaukee, serves all of the city, but maintains a special focus on its surrounding neighborhood, including Marquette University. The Church of the Gesu and Marquette are separately incorporated, but share a long standing collaborative relationship. While Gesu Parish is staffed by Jesuit priests and lay pastoral associates, from time to time Jesuit priests from the university assist with liturgies, and many university specific events, like the Mass of the Holy Spirit at the start of each school year, are conducted at the church. The roots of the shared collaborative relationship goes back to when the Jesuits first came to Milwaukee in the early 1850s. The Jesuits were actually successfully running the predecessors of Gesu Parish (St. Gall and Holy Name parishes) well before the university was founded in 1881. For much of the church's history, its basement lay unfinished. Under the guidance of Rev. Richard A. Cahill, S.J., the 12th pastor of Gesu, who served from 1941–63, the Lower Church was created. Today, it features 11 altars, eight confessionals and can seat about 1,000 people. The Lower Church holds Mass every day except Sundays.